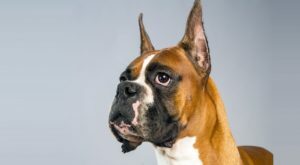 I took five of the most common myths I’ve heard about Boxers, and I’ve tried to find out the truth about these dogs. This is probably what scares most potential dog owners. The truth is that any dog can be aggressive, from Chihuahuas to German Shepherds, in the absence of proper training. However, there’s no reason to believe that Boxers are more aggressive than other breeds. Despite their imposing looks, with large heads and muscular bodies, Boxers are gentle dogs, with a friendly and playful temperament. In fact, they’re guard dogs, and your Boxer will always be ready to protect you or your family when needed – but they’re not going to attack anyone. Aggression can be normal in dogs and depending on what causes it, you’ll be able to solve the problem with training. In rare cases of selective breeding it has genetic causes, so there’s little chance of getting an aggressive dog if you buy her from a responsible breeder. Boxers need three years to become fully mature, which is why many people say they never grow up at all. But this doesn’t make them hard to train. You just need to be patient and consistent, and results will appear gradually. never punish your dog, as she’ll respond badly to your methods. Boxers are indoor dogs, so teaching them to eliminate outside is a must. When they grow, they tend to become a little stubborn, so the sooner you start with housebreaking and obedience training, the better results you’ll get. This is another false myth about Boxers. In fact, the American Kennel Club says these dogs are a popular choice for families, being “patient and spirited with children.” (This gentleness with kids can be seen even with Boxer mixes, like the Boxer-Bulldog mix.) Furthermore, Boxers are protective with their children and always ready to defend them. The only inconvenience when you have small kids can be the Boxer’s habit of jumping on people, but this can be controlled easily once you start obedience training. Always remember to watch your young children when they’re playing with a dog, to prevent incidents. After all, a Boxer is a medium–large dog (60-70 pounds/ 27-31 kg), with a powerful body and high energy levels. This is partially true. Having great watchdog abilities, a Boxer will bark every time she senses an intruder coming close to her home. Many of these dogs also snore loudly. However, Boxers rarely develop excessive barking, and when they do it’s caused by a lack of exercise, or by boredom. Boxers need between one and two hours of intense activity each day: walking in the park, running, playing fetch or Frisbee, jumping or chasing balls. You need to keep your dog in good shape not just physically, but also mentally, so organize training sessions and stimulating activities to keep her mind busy. Don’t keep your dog locked up for too long either, either. Boxers love spending time with their families, so keeping her away from you for too long can make her bark out of loneliness. As these dogs have a short coat, many potential owners tend to think they’ll have little or no problems with dog hair. 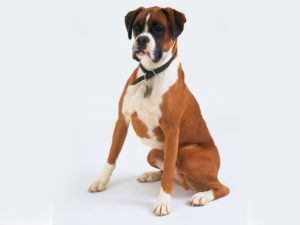 The truth is that Boxers do shed, especially during spring, so if you want to have such a dog, get ready to be removing pet hair from your clothes quite often, and to use the vacuum cleaner several times a week. To keep hair loss under control, you need to brush your dog’s coat three times a week to remove dead hairs from her body. On the other hand, Boxers have moderate-to-low grooming necessities, so you won’t spend too much time bathing or cleaning your dog’s ears. Choosing a responsible breeder is the easiest way to have a healthy dog. A good breeder can guarantee standard breed characteristics and give you reliable information about the dog’s parents. Also, ask whether your future puppy has been checked for heart murmurs and parasites. You can find more information about Boxer breeders from the American Kennel Club, Canada’s Guide to Dogs, The Kennel Club, or The Boxer Association of Victoria INC. Other good sources for puppies are the Boxer Dog Clubs and the local rescue shelters. I think a Boxer is the perfect dog for any family. If you take her out for a walk each day and organize one or two play sessions, you’ll have a happy dog, always ready to guard over you and your family. What do you think about Boxers? Do you have any experience with them? Let us know more about these great dogs with your story in a comment below. I agree with everything you have said. I have a 5 year old, fawn female named Bailey. She is an unbelievable dog. Great with the kids and anybody who will pet her! Gets along with all the other family pets particularly the cat who she loves to play with! She is a great watchdog and only barks if someone or something is around. I would highly recommend a boxer for any loving family. We adopted a boxer mix from the humane Society at Thanksgiving he is a loving and gentle boy only barks when he needs to. He’s gentle and sweet but also playful and rough sometimes and we love him so much.